Albert was born on 26th January 1885 at 76 Moseley Street, Aston, Birmingham. His father was then a bricklayer. According to the 1901 Census, Albert, aged 16, was a bricklayer labourer living with his family. Albert married Emma Elizabeth Benson, who was born on 10th June 1884, on 4th July 1908 at the Parish Church of St Oswald, Bordesley, Birmingham. 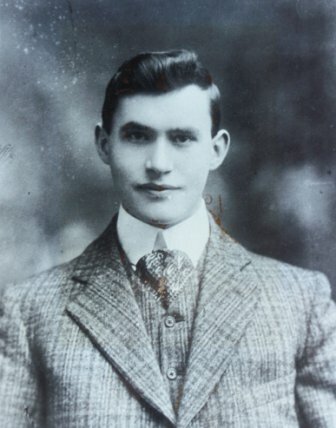 Albert was aged 23, a builder, living at 155 Broad Street, Bordesley, the son of James Hawkings, a builder. Emma Elizabeth was aged 24, the daughter of John Benson, deceased, formerly a Manager; Emma was then living at 91 Somerville Road, Birmingham. Dora A. Benson, Emma’s sister, and Isaac Benson, possibly her Uncle, were witnesses at the wedding. In 1965, John and Joan were living at 191 Longmore Road, Shirley, Solihull. June Margaret Hawkings who married Arthur Philip Chambers and had 4 children. In 1947, when Albert’s daughter, Dorothy, was in New Zealand, Albert and Emma’s address was Tudor House, Flyford Flavel, Nr Pershore, Worcestershire. Emma died on 1st May 1965 at her home – The paddock, Flyford Flavel. Emma was aged 80, the wife of Albert Hawkings, Chocolate Worker. Albert was the informant. Albert died on 25th December 1973 in Kidderminster General Hospital. He was a retired builder, living at Dunedin, Astley Burf, Stourport on Severn, Worcestershire.. His son in law, Dorothy’s husband, Arthur, was the informant.